FRSC redeploys 109 personnel – Royal Times of Nigeria. The Federal Road Safety Corps, has redeployed 109 personnel as part of efforts to enhance its operational efficiency, the Corps Public Education Officer, Bisi Kazeem has said. 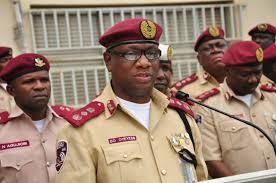 Kazeem in a statement on Friday in Abuja, quoted the Corps Marshal, Dr. Boboye Oyeyemi, as saying the shakeup was aimed at actualising the 2018 strategic goals of the FRSC. Assistant Corps Marshal Victor Nwokolo, formerly Head of Section, Special Marshals, is now the Head of Section, Command and Strategy Administration, while ACM Kayode Olagunju, who was the Head, Policy Research and Statistics, will proceed on a course at the Nigerian Institute of Policy and Strategic Studies, Kuru, Jos. Kazeem said ACM Stephen Maitizumahs, formerly in charge of Administration and Training, is now the Zonal Commanding Officer, Zone 3, Yola. ACM Kayode Fanola, formerly on a course at NIPSS, takes over from Olagunju as Head of Policy, Research and Statistics at the headquarters. The FRSC spokesman said, “ACM Godwin Ogagaoghene, former ACM Personnel at the headquarters, is now the Zonal Commanding Officer, Abuja.